APTET Paper I, II, III Final Answer keys: APTET Paper I, II, III Final Answer keys are released on 12-03-2019 and Final Answer keys are available on APTET Website. Commissioner of School Education, CSE Andhra Pradesh has released the initial final keys for the Andhra Pradesh Teacher Eligibility Test or APTET 2019. The Final answer keys for the examination are now available on the official website aptet.apcfss.in. Candidates who have appeared in the examination can check the answer keys on the official website. The direct link to check the answer keys along with the steps to check answer keys is provided below. The question papers and link to raise objections is also available on the official website. 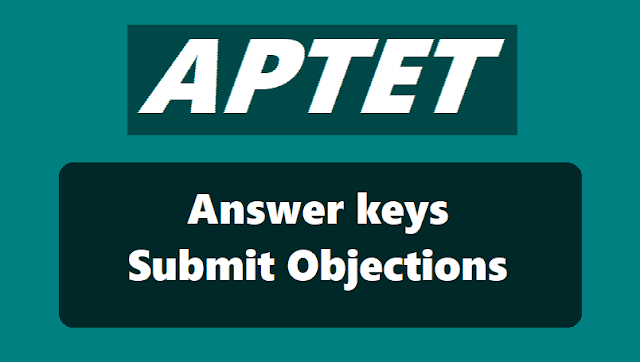 APTET 2019 final answer keys released at aptet.apcfss.in: APTET 2019 answer keys: The Commissioner of School Education has released the final answer keys for the Andhra Pradesh Teacher Eligibility Test (APTET 2019) on the official website – aptet.apcfss.in. All those candidates who had appeared for the same can check the keys by at the website itself. The exam was conducted from .. June to .. June 2019 in two sessions 9:30 am to 12 noon and 2:30 pm to 5 pm. APTET 2019 tentative answer keys were released in the first week of June. Candidates were given time to raise objection(s). With the release of final answer keys, the results of the teacher eligibility test is likely to be out this month itself. Candidates to please note that these are Final answer keys and they can not raise objections to the given answers. Candidates can check their question papers and corresponding answer keys. The steps to check the answer keys below. Step 7: Download it and Check your score. All the candidates are advised to raise objections if any at the earliest. The window to raise the objections would close in two days. APTET 2019 answer keys are now available. The results would be calculated on the basis of the final answer keys which would be released after giving proper consideration to the objections received. The decision of CSE on the answer keys, however, would be final and binding. APTET 2019: Andhra Pradesh Teacher Eligibility Test, APTET 2019 final answer keys have been released. Candidates who had appeaered for the APTET examination conducted from June .. to June .. can now log on to aptet.apcfss.in to find the answer key to their respective papers they appeared for. Steps and direct link to download the APTET final key 2019 have been given below. Final answer keys for Telugu, Urdu, Hindi, Kannada, Tamil, Odiya, Social Studies, Sanskrit, English Mathematics and Science papers have all been released. Candidates are kindly advised to keep their question papers and hall tickets ready in order to be able to predict an estimated score. Meanwhile, response sheets have also been released and are available on the official website aforementioned. Step 1: Log on to aptet.apcfss.in using the direct link given here. Step 2: On the homepage, click on Final keys Click here. Step 3: A new window would open.Links to the answer keys for all the papers mentioned above are available on that page along with the date and time of the examination mentioned. Step 4: Also, download your response sheets from the same website at the provision of hall ticket number and date of birth. Step 5: Once you click on the exam you need to see the answer key for, a PDF file would open or get downloaded. Step 6: Take a print, if you have to. Tally an estimated score with the help of the official answer keys and the response sheets.